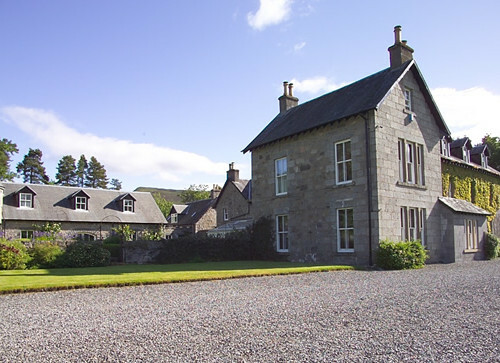 This Unique Large Highland country sporting lodge enjoys stunning location, Luxury facilities and the atmosphere of a large Scottish Highland home, sleeping up to 12 Adults and 5 Children in 9 Grand Bedrooms. 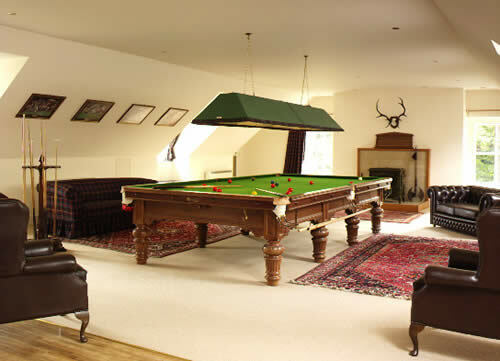 Camuseritch Lodge is not for everyone (no Hot Tubs here) but a Luxury Heated indoor Swimming Pool, Helicopter Landing Pad, Log Fires, Gymnasium, Games Room, Billiards and even an onsite Chef for hire are pretty good compensation for the most discerning customers. 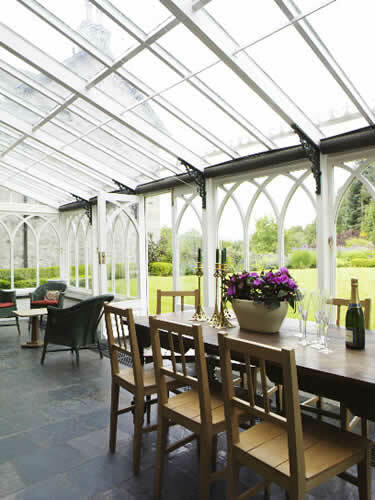 This is a place to unwind and relax with friends either in front of the fire, round the swimming pool, playing snooker or enjoying a drink in the wide conservatory. 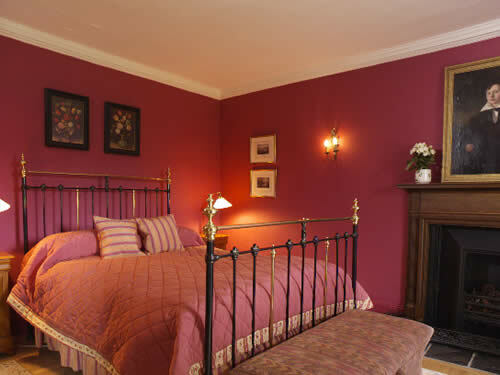 Camusericht is furnished with fine antiques and art work, the reception rooms decorated in warm intimate colours. 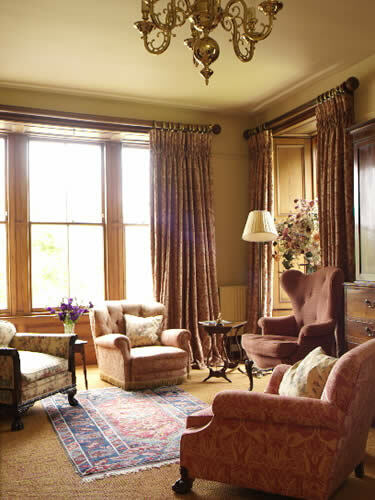 Spend the day on the hills walking, watching eagles and ospreys, or out with the game-keeper stalking or simply watching the wildlife, and return to deep steaming baths with a dram or two before having dinner in a candle-lit dining room. 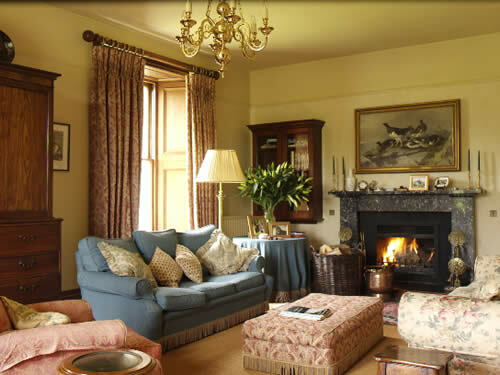 Finish the day relaxing on deep sofas round the fire in the drawing room. Camusericht Lodge overlooks the beautiful waters of Loch Rannoch and the distant peaks of Glen Lyon. 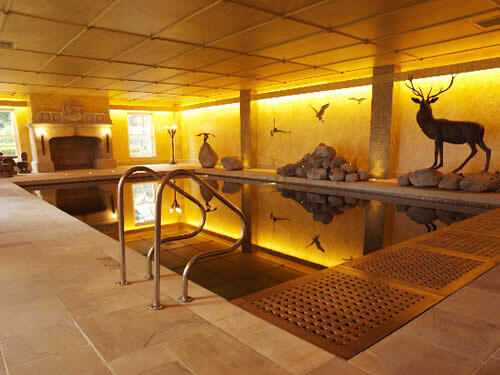 It is just under an hour’s drive from Pitlochry and an hour and a half from Perth. 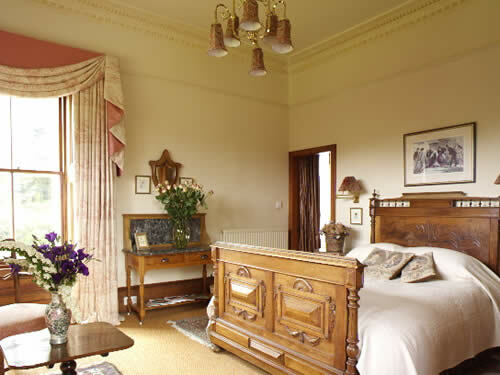 Lodge Features the Bedrooms – Sleeps 10 to 12 adults plus 5 children in 6 doubles (2 zip and link beds), 2 twin & 1 single, 5 bedrooms ensuite and 3 additional family bathrooms with a mix of baths and showers. 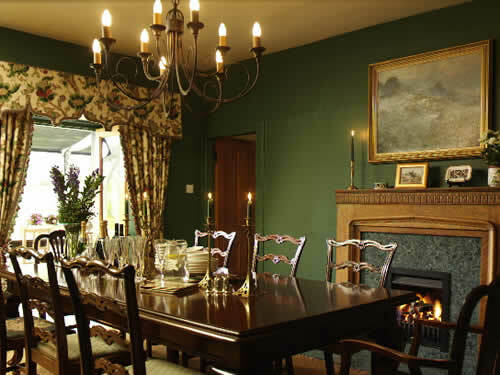 The Dining Room – Seating 10 in front of gas fire. 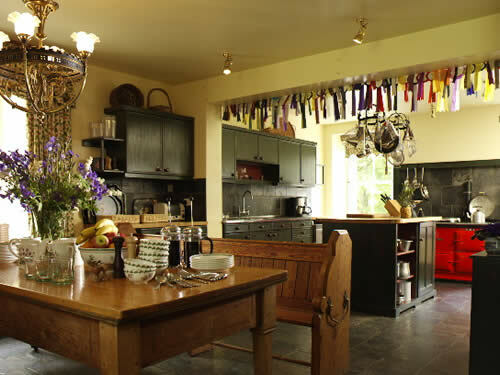 The Kitchen – Aga, Fridge/freezer, dishwasher, laundry facilities. Office facilities (copier and printer) are available in the Gunroom for those who wish to keep in touch with business opportunities. Internet connection is also possible if guests provide their own laptops/computers. Ground Floor: Hall with wood burning stove, sitting room with open fire, dining room, conservatory, TV snug with open fire, study with wood burning stove, kitchen with gas fired Aga and breakfast area. First Floor: Master bedroom with views over loch, en-suite bathroom and dressing room, 2 double bedrooms with en-suite bathrooms, double bedroom, bathroom with separate shower. 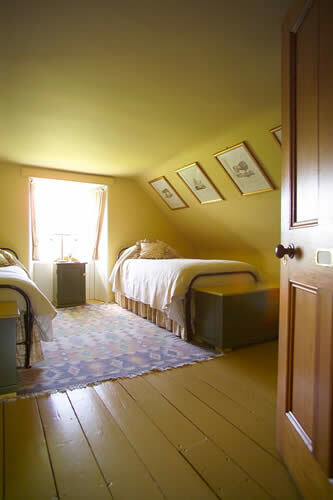 Attic Floor: Bedroom with large twin beds, en-suite shower room, 2 double bedrooms, twin bedroom, single bedroom, 3 bathrooms. Hire charges include all Heating, Electricity, Towels, Bedding and complimentary WIFI, Solid Fuel and use of all facilities. 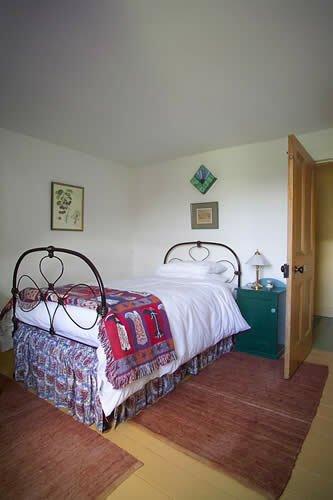 The lodge is let with the services of the house-keeper. If a chef/cook is required this can be arranged by contacting the Office. If you wish to bring dogs, a good housekeeping deposit of £1000.00 will be required. A maximum of two dogs are welcome in the house on the ground floor only. They must be kept under strict control at all times. There are external kennels available. 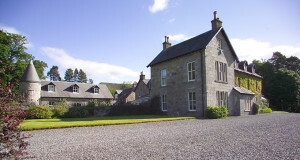 Fishing for brown trout (15th March – 6th October), in the Loch is included in the rental. Sporting by arrangement.